Submitted by AdreannaDrea on 2018-04-25 01:21. Over 200+ male and female portraits, high quality and hand tailored to fit a variety of class and race roles. I've tried to make sure there's no anime or (heavens forbid) Luis Royo - I was sick of portrait packs being so incredibly filled with junk that I made this one a while ago. I've handpicked each of the pictures for their quality and suitability to the D&D world. I'll constantly be updating with more as time goes on. Your most likely bet to have up to date packs will be via Steam, as that's where I'm most active - but I'll try and keep this one updated too. 19/05/18 - Added roughly 100 more portraits, 60 odd to the male pack and 40 odd to the female. 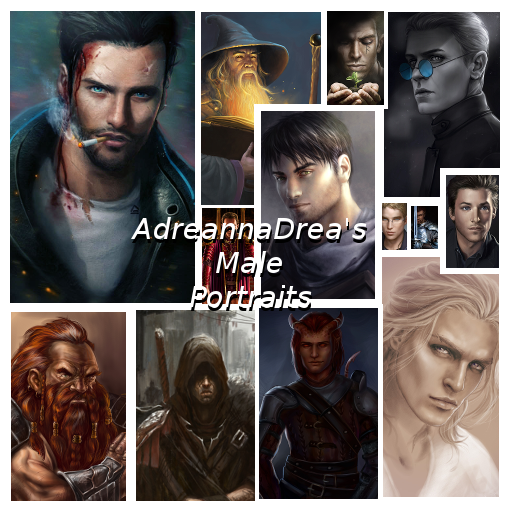 25/05/18 - Added 86 new portraits to the male pack. 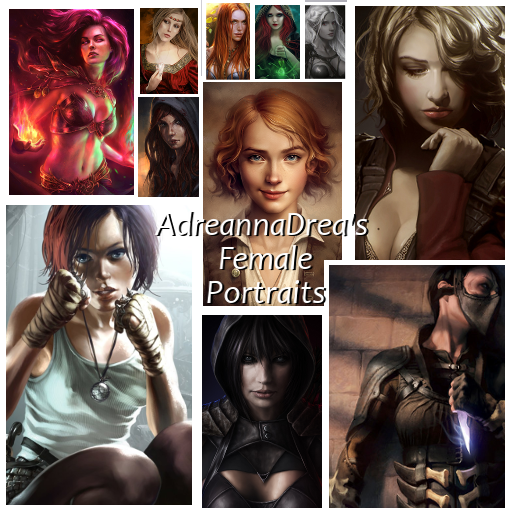 This includes more orcs, goblins and drow, as well as some more general portraits. Also removed a duplicate portrait. This is a great collection. Thank you for sharing! Oh no! I thought I'd got most classes at least two or three examples! Given that bards are my second favourite class, I really should have more. Let me fix that in the next update. I hope I counted correctly, but I've just seen one violin. Btw. I have no problems with portraits which fit nicely into a d20modern mod. I've been waiting for this one to hit the Vault! Looks deeelicious! Thank you for sharing with the community! According to the Vault Voting Standards, "4 - Some Merit, Requires Improvements". James Dean and Lara Croft? What else will I have to remove to make this usable? Sorry, but modern portraits are not suitable for a D&D world. If you remove all of the modern portraits, I will happily reevalulate and change my vote accordingly. Hiya! Sorry to hear you don't like some of the choices I've made. I did specifically choose a few modern examples, just in case there's more of a hi tech server that wanted to use something more 'current.' I've got a few outliers of bionic arms or smoking and such - but I wouldn't say they don't fit into the setting! Either way, thank you for your evaluation and the time you took to give it! I'll be updating periodically with more as I become inspired, so keep an eye out! If you have a portrait pack with a variety of pics that cut across genres, don't advertise it as "suitability to the D&D world". Instead advertise it as something like 'useful for a variety of worlds, cutting across genres, and facillitating mashups' or something like that. TSR and Wizards of the Coast (the original & current owners of D&D) have never conflated modern images with D&D. They have always been careful to to use terms like 'd20 Modern' to call out modern content. D&D as defined by the creators and current owners literally means Dungeons & Dragons. Several games have been based on the D&D rules that are not pseudo-Medieval such as d20 Modern, Gamma World, and Boot Hill but none of them are called D&D. Thus using the name D&D for a cross-genre portrait pack is misleading. That said, a cross-genre portrait pack is still a pain in the neck. If I want a portrait pack for a modernish Lovecraft adventure, then I have to remove all of the non-modern pics. Whereas if I want to create a D&D adventure, I have to remove the modern pics. And If I want a Weird West adventure, I have to dump the D&D and d20 Modern pics, et cetera. Therefore due to the inability to use a cross-genre portrait pack without having to modify it, I stand by my vote. I am fine with all the portraits myself, just because it was created as a D&D game, doesn't mean that ALL worlds are fantasy D&D worlds.. Example, Last jedi, Zombieland etc. That's what I was aiming for - variety, but not at the expense of quality. Thanks for your review! I've only looked at the male portraits since that's what I'm searching for atm. Great stuff, and all of it high quality, good proportions and tasteful. Thank you!